All success stories have one thing in common: They don’t happen overnight. Rather, there’s no magic moment when everything just falls into place. Building a business, after all, requires massive amounts of hard work and a strong foundation to build your business on. This has certainly been the case for each of my own businesses, as well as for superstars like Elon Musk, Jeff Bezos, Warren Buffett and more. It also holds true for Alex Theuma, founder of SaaStock, the largest SaaS conference in Europe. Since its launch in 2016, SaaStock has seen its attendance grow exponentially; it continues to grow today. I recently sat down with Theuma to discuss how he was able to build such a successful event. Here are the five steps he told me he took to find success. SaaStock wasn’t just pulled out of thin air. In fact, Theuma didn’t even start out looking to build a conference. With his sales background, he decided to start a blog called SaaScribe, targeting the SaaS startup community. After writing for the blog for about a month, Theuma decided to supplement it by launching a podcast. Through both of these endeavors, he was able to build an audience and connect with members of the SaaS community. In this way, he started to make a name for himself. Tip: When you’re just starting out, you can’t come right out of the gate with your big idea and expect people to go for it. Building your reputation and audience first is necessary for future success. On his podcast, Theuma interviewed leaders of SaaS businesses — people who would later go on to become major influencers. Through these interviews, he began to build relationships that boosted his own reputation. “Because I was an early mover, I started to have these conversations,” he told me. “I started to build a bit of credibility and continue these conversations offline.” He also began organizing SaaS meetups to bring the SaaS community together in person. This really set him apart, as he was able to connect with his audience on a deeper level and build trust. Tip: It’s true what they say: Your network is your net worth. Building your network allows you to grow a community and a following — followers who will buy what you plan to sell. Theuma was looking to grow his business and monetize it, but he wasn’t sure what that would look like. But through those meetups, he really began to understand his audience and what they wanted. He began thinking about a larger event and tested the idea on them. Tip: Understanding your audience is critical for any type of business. If you don’t know what the audience wants or needs, how can you ever be sure that your idea will work? Once he had the idea for the conference, Theuma needed to get it off the ground. That’s where all his hours spent building his network and laying a foundation paid off. After interviewing Nick Franklin of ChartMogul for his podcast, Theuma kept in touch and continued to nurture the relationship. “I worked over a period of eight or nine months to build that relationship, build that trust,” he said. Eventually that trust paid off, as ChartMogul became the first sponsor for SaaStock. Without that relationship and those months of hard work he put in to grow that trust, SaaStock may never have even happened. In its first year, SaaStock had 700 attendees. By its second year, the number of attendees had grown by 114 percent, to 1,500-plus. This year, Theuma is aiming for stellar growth again, at 3,000. Despite his success, Theuma continues to utilize the same strategies that led to his success in the first place. He still runs his blog, SaaScribe, and continues to do meetups around the world, now retooled into one-day conference events. With these smaller events, Theuma is continuing to build awareness for the larger conference. 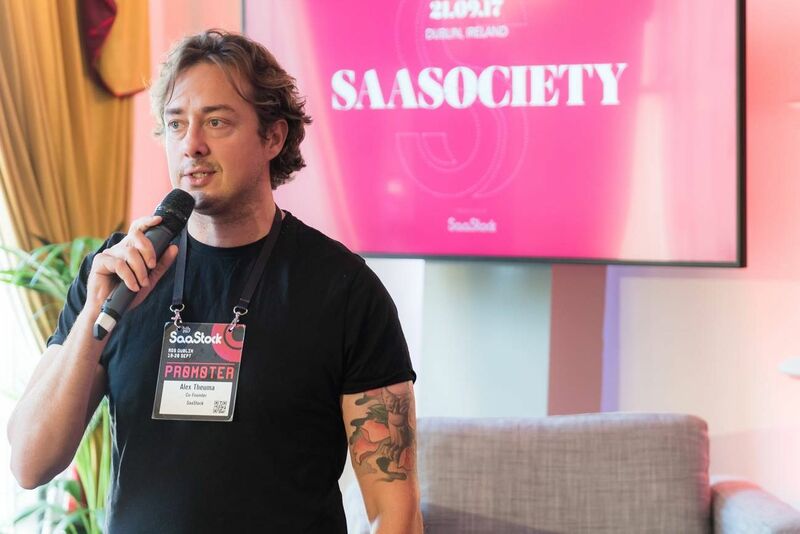 By going to the cities where the SaaS community already is, he widens his network and gains attendees for SaaStock, who therwise might not attend. “We realized the importance of going to the people where they are and meeting them,” he explained. Tip: Theuma sticks to his roots and continues to lay the foundation for growth, just as he did in the beginning. As an entrepreneur building your own business, you similarly need to focus on the long game. By laying the groundwork for the future, you can steadily build upon your success.